Fellowes Advanced Computer Series Surge Protector, 7 Outlets, 6 ft Cord, 840 Joules - 7 outlet surge protector is ideal for small office machines and electronics. 840 joules plus EMI/RFI noise filtering, catastrophic fuse, illuminated on/off switch and 15-amp circuit breaker. LED surge protection indicator with wiring verification; 6' power cord. 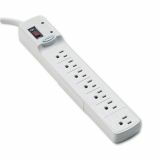 Outlet orientation and spacing accommodates AC adapters. $50,000 Connected Equipment Warranty. UL and cUL approved.